In June 2014, the FDA approved ReWalk™, a revolutionary new technology for use at home and in the community, that allows individuals with spinal cord injury to stand and walk. A representative from ReWalk Robotics visited Bacharach in early September to introduce our physical and occupational therapy teams to the newly approved wearable exoskeleton. Today, Bacharach is one of few facilities in the region to offer this amazing new device and enable paralyzed patients to walk again. ReWalk was developed by Dr. Amit Goffer, an Israeli inventor who became a quadriplegic after an ATV accident in 1997. He developed the ReWalk based on his own experience using mobility devices. Providing powered hip and knee motion, the ReWalk enables individuals with spinal cord injury to stand upright and walk. Patients wear a brace support that is individually fit to their body and a backpack with a computerized control system and motion sensors. 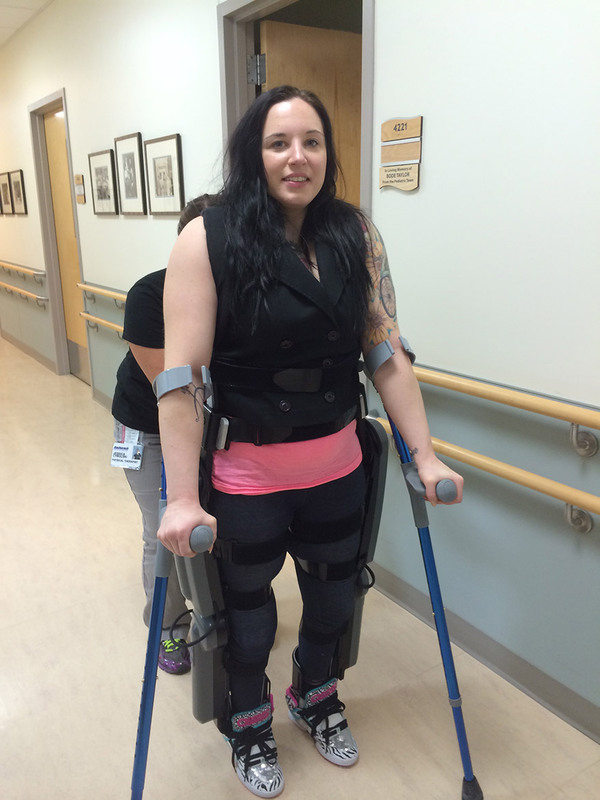 Another patient, 23-year-old Becca Guilbeaux, was also able to walk using the ReWalk exoskeleton – for the first time since becoming paralyzed in a car accident at age 19. She said, “It is an amazing piece of technology. It was so great to be able to get up and just walk and have that normal feeling. It only took a few minutes to get used to it.” Becca foresees the ReWalk evolving in a the way cell phones did, becoming slimmer and more narrow so that someday, she might be able to wear it under her clothes. Patients who receive a prescription from their doctor can make an appointment for an evaluation to use the ReWalk at Bacharach. For more information, contact: Becky McGill at 609-652-7000 x 5411.